Walk the 12.5 miles of aisles of the SHOT Show floor and it’s easy to be overwhelmed by all that is gaudy and big. Especially on the top floor where huge banners hang above the booths of multi-million dollar companies cutting mega-dollar business deals in their huge exhibit booths. Add in the sizable displays of new shooting, hunting and outdoors products, not to mention the crowd of humanity pressing in to sign a deal, gain a celebrity autograph or even snap a smartphone selfie with a television personality and it’s easy to feel like you’ve discovered the heartbeat of the SHOT Show. But really, that’s not the heart and soul of the annual outdoors trade show on the Las Vegas Strip. Because that’s on the bottom floor of the Sands Expo Center, the crowded lower aisles where the show’s backbone is found among a myriad of smaller businesses, companies working hard to make it in the world of big business and megadeals. 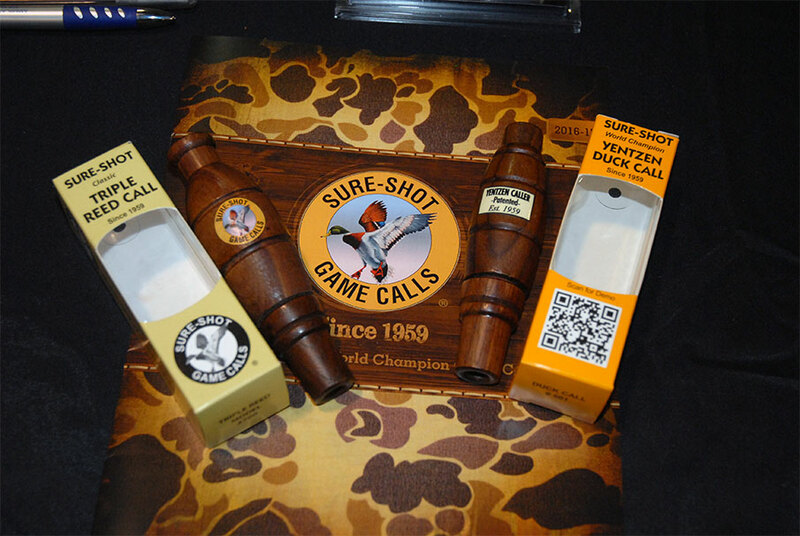 One of those companies is Sure-Shot Game Calls of Groves, Texas, a manufacturer that once had a large share of the duck and goose call market. Now on the comeback trail, the company’s CEO and president, Charlie Holder, and his staff man a bottom floor display booth as they work their way back towards the top of their respective field. “At this juncture of our business, we are just getting back into the mainstream markets again after Mr. Jim “Cowboy” Fernandez, our founder, took a hiatus and was going to close the company down,” said Holder. As the once proud business declined, it led to a 10-year absence from the SHOT Show, a time in which the rich legacy of the company threatened to fade into nothing more than a camouflaged memory. But before that happened, Fernandez eventually sold the business he and George Yentzen had formed, an early-days call-making company that featured world duck-calling championships, big orders from outdoors retailers and even an appearance on The Tonight Show with Johnny Carson. With that sale, Holder took over and began to map a return of Sure-Shot to become a player in a duck-call market that had changed greatly in only a few years time. Step one for Holder to return Sure-Shot to its former place of prominence was to find a way to get back to the SHOT Show, something that the company had been a part of for many years. But that was a few years back, prior to the company’s slide away from the top of the call making game. After Holder assumed control of Sure-Shot, he began working to overcome any obstacles that prevented a return to the Las Vegas-based trade event. That involvement gained the company some traction as media members and industry buyers took note of the company’s reemergence. “The second year, we came back to Media Day and launched the Yentzen One,” said Holder. And then came the opportunity that Holder was looking for, a cracked front door back into the annual SHOT Show event. “Now we’ve got a booth back (on the SHOT Show) floor,” he said. As Sure-Shot’s presence at the SHOT Show has reemerged over the past couple of years, the opportunity has arisen to showcase new products from the company’s upgraded in-house manufacturing facility. Last year, the company focused on its flagship model, the Yentzen One, a high-tech modern upgrade to the famous double-reed duck call Cowboy Fernandez used to capture the 1959 World Duck Calling Championship in Stuttgart, Ark. This year, Sure-Shot has introduced a new and improved version of Fernandez’s triple-reed duck call design from the late 1960s. Cut from a single black-walnut blank of wood, the Sure-Shot Model #700 Classic Triple Reed (MSRP $64.95) is catching the attention of buyers due to its classic looks and ease of use. As a result, Holder indicated business was steady in his booth during the 2016 SHOT Show. In Holder’s mind, that steady stream of potential customers in Vegas means people are sitting up and taking notice of Sure-Shot once again. “After being out of it for 10 years, it’s very important to connect with media, folks in the retail world and other vendors and manufacturers that we work alongside,” said Holder. Even if the bulk of yearly business for the reborn call company doesn’t always happen on the show floor itself. Because being remembered is sometimes more important for a company than the numbers of sales that may or may not happen in any given year. “It seems that if you’re not there (at SHOT), you’re not remembered,” said Holder. “It’s so overwhelming, but if you don’t see (a company at SHOT), you don’t remember them. Now that his company is back at SHOT, Holder is aiming for an even bigger presence in the years to come. One way of doing that is for Holder to partner with industry giants like Nissan, the sponsor of this year’s NSSF (National Shooting Sports Foundation) Press Room at the SHOT Show. To that end, Sure-Shot provided product that was given away on the second day of this year’s trade show at a press conference hosted by Nissan. It may not seem like a lot to some, but for Holder, being associated with the right people and companies means much. “We’re a call company,” said Holder. “And any bright person can do the numbers (and see) that there’s no one making (millions) of dollars in game calls unless you’re doing TV shows and selling Si’s tea cups. Another way for Holder to reset his company’s place at the duck-call-making table is to be sure that he effectively communicates with the company’s growing customer base. “We sent out an E-Blast to everybody before the show, letting them know about the new triple-reed (call) with our press release, letting them know that we’re at SHOT Show again, what our booth number is and (trying) to create some presence (there),” said Holder. Holder engaged his customer base in real-time – and potentially attracting new customers – with the use of social media, including Facebook, Twitter and Instagram posts from the show floor itself. In Holder’s mind, all of this is necessary to strategically move forward. And it doesn’t hurt that Sure-Shot has a sweet spot on the SHOT Show aisles this year, bottom floor or not. “Even if you’re not looking for Sure-Shot, you go to the first aisle and you start browsing (and) we’re right there,” he added. A spot that is all part of Holder’s strategy to return the company to a place of prominence and higher profits in a market that Sure-Shot Game Calls and its founder Jim “Cowboy” Fernandez once helped to build. An industry that Holder wants to be a major player in once again, a Sure-Shot presence in a retail game that the annual Vegas trade show helps to set. Even on the bottom floor, an area of business that forms the very backbone of the yearly SHOT Show event.